Arthritis is common in the knee joints. Arthritis is a common condition that affects the joints. 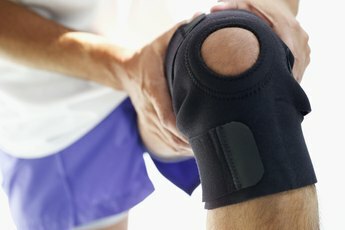 According to the Centers for Disease Control and Prevention, 50 percent of the population may develop symptomatic knee osteoarthritis by age 85. While previous thoughts were to avoid exercising damaging joints, research has now shown that exercise is essential in managing symptoms. A 2001 study published in the Archives of Internal Medicine showed that regular exercise reduces the risks of daily living disability in adults with arthritis in the knee. Exercises such as leg lifts and leg curls work the muscles in the legs that support the knee. Before beginning any exercise program, consult your physician. You may need to take special considerations regarding your knees. If the muscle tone in your quadriceps has atrophied due to your arthritis, this is where your focus should begin. The quadriceps, or thigh muscle, is essential to straightening the knee. In many leg lift exercises, the ability to keep the knee straight is essential for proper technique. Sit on the floor with your upper body leaning back and supported by your arms. Contract your thigh muscles so that your kneecap moves upward toward your thighs. Hold this position for five seconds and then relax. Repeat this for 20 repetitions. To perform the straight leg lift, it is essential to have good muscle tone in your thighs for proper technique. Lie on the floor with your upper body propped up on your elbows. Extend your legs out straight with your knee flat. Slowly raise your leg to a 45-degree angle, hold for one second, and slowly lower the leg. Repeat 20 times and then do the same with your opposite leg. Do not allow the knee to bend. If you are unable to keep your knee straight, return to the quadriceps setting exercise to improve muscle tone. As you build muscle tone, consider adding light ankle weights. The short arc lift requires the use of a rolled up towel or blanket. Lie on the floor with your upper body supported by your elbows. Place the rolled up towel underneath your knees so they are slightly bent. Slowly lift one foot so that the leg straightens. Hold the leg straight for five seconds and then slowly return to the bended position. Repeat 20 times. The hamstrings are at the back of your thigh and assist in bending the knee. The standing hamstring curl works to strengthen the hamstring. Stand straight next to a table, chair or wall that you can use for support. Bend one knee up and raise your heel toward you buttock. Hold this position for a few seconds and then return the leg to the straightened position with your foot on the floor. Repeat 20 times with each leg. As your hamstrings strengthen, consider adding light ankle weights. Can the Lack of Stretching Cause Knee Pain?